Handmade Pendants, each made with an actual Classic American Doll Stamp from the 1997 Collection. These stamps are now collectors items. Choose your favorite one, and you will treasure it for years to come. Each stamp comes safely mounted in a beautiful hand cut glass frame, complete with a 24" ball chain necklace and a silk ribbon accent in the color of your choice. Wear it around your neck for all to appreciate, or hang it as a wonderful ornament to put on display. We have a limited number of each stamp available so don't wait to claim one for yourself! 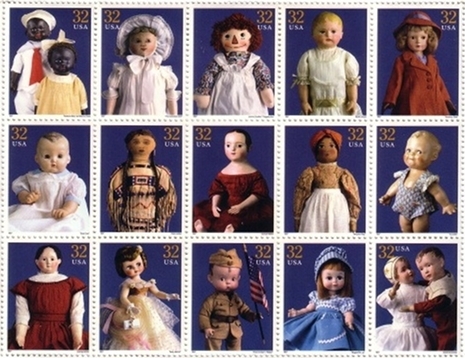 "The Colombian Doll" Plains Indian "Betsy McCall"
Johnny Gruelle's Izannah Walker Perry Crosby" Skippy"
Martha Chase "Babyland Rag" "Maggie Mix-up"